Measurements: 2.6 x 4.73 inches, or 67 x 119 mm. Back of card: Unusual for a Lo Scarabeo deck: A full-size image of the Magician (shown above), in muted gray-greens. Around him, a fancy gray-green border. Usually, Lo Scarabeo puts half an image on top, inverts the same image for the bottom, for easy inversion. Not here. Booklet included: Yes, a long folded sheet with 14 panes. Each pane measures 2.6 x 4.73 inches, or 67 x 120 mm. Publisher: Lo Scarabeo. Printed in Italy. Imported by Llewellyn. Comments: The Master, in this case, was the original artist, Giovanni Vacchetta (1863-1940). 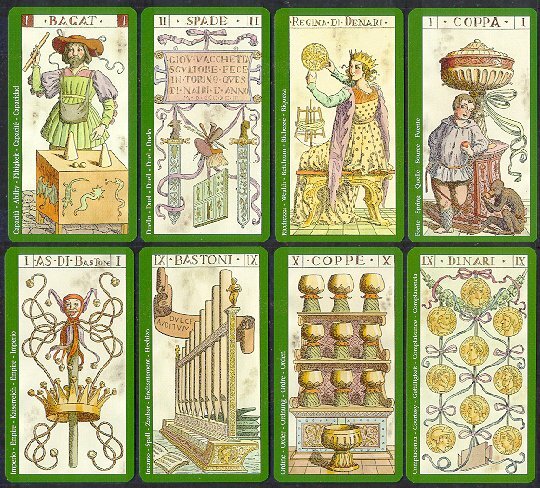 This deck was originally published in Turin in 1893 with the title, "I Naibi di Giovanni Vacchetta". Michela Gaudenzi colored the deck in 2002. The original edition of this deck had extremely limited distribution in northern Italy & was probably not an influence upon (nor known to) the various members of the Order of the Golden Dawn who subsequently produced a number of significant decks. (Eg, AE Waite, Pamela Coleman-Smith, Aleister Crowley, Paul Foster-Case, et al.) In reprinting this deck, Lo Scarabeo reminds us that the shift from a straight Marseilles-type deck with playing-card type pips, to the fully allegorical pips of the Waite-Coleman-Smith deck, was gradual. Not all the pips in this deck get the treatment shown above, and at best, the pictures are restrained. Original titles in Italian are supplemented by keywords on the left side of the card. Languages: Italian, English, German, French & Spanish. The Italian original says, simply, IX BASTONI. Keywords for the same card are Incanto - Spell - Zauber - Enchantement - Hechizo. Not quite a Marseilles deck, but not a modern one, either. The modesty of approach is refreshing. This is an enjoyable deck.